KawaiiPunk - Kawaii Mascot Blog: Horoscope Prediction Comes True! Something old, something new, something borrowed, something blue. Congratulations! Looks like a photo of a Smurf is headed your way! 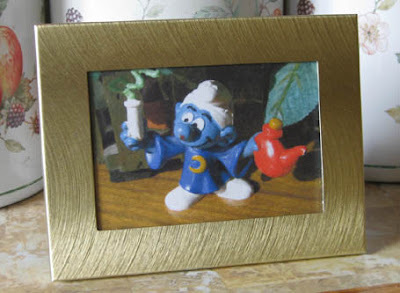 A newly framed photo of a vintage Smurf toy for me to temporarily look after! Something old, something new, something borrowed, something blue! I couldn’t believe it! Needless to say I have now taken stock and decided my sceptical attitude to horoscopes is well and truly a thing of the past! Long live foolish mumbo jumbo!